This article is part of an ongoing series analyzing how the government shutdown and the debate over raising the debt ceiling are affecting Americans' views of government, government leaders, political parties, the economy, and the country in general. PRINCETON, NJ -- Eighteen percent of Americans are satisfied with the way the nation is being governed, down 14 percentage points from the 32% recorded last month before the partial government shutdown began. This is the lowest government satisfaction rating in Gallup's history of asking the question dating back to 1971. The previous low of 19% was recorded in September 2011, just after Washington lawmakers reached a last-minute agreement that forestalled a government default. 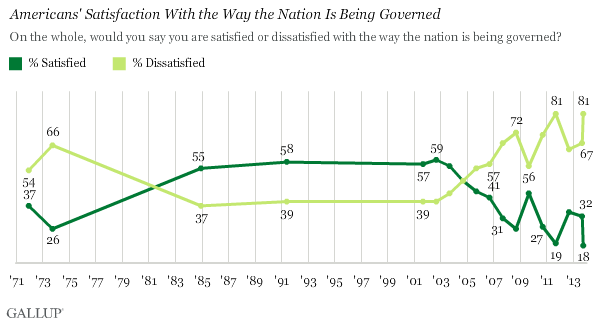 More broadly, less than half of Americans have been satisfied with the government since 2004. These most recent data are based on an Oct. 3-6 Gallup poll, and are the latest in a series of reports underscoring the negative impact the shutdown is having on Americans' attitudes toward their government. Prior to 2011, the lowest level of satisfaction with the way the nation is being governed was 26% recorded in September 1973 -- in the middle of the Watergate scandal. Democrats are more likely to be satisfied with the way the nation is being governed (28%) than are Republicans (8%) or independents (15%). This partisan difference was even greater last month, when 54% of Democrats were satisfied, compared with 11% of Republicans. Thus, Democrats' higher satisfaction with government has apparently been significantly eroded by the current events in Washington, while Republicans have maintained their already low satisfaction levels. Americans' satisfaction with the way the nation is being governed has dropped dramatically over the past month, providing still another example of how the government shutdown is having a detrimental impact on Americans' attitudes. Gallup data also show that Americans now express less favorable attitudes toward their leaders in government, and now cite dysfunctional government as the top problem facing the U.S. today. Results for this Gallup poll are based on telephone interviews conducted Oct. 3-6, 2013, on the Gallup annual Crime survey, with a random sample of 1,028 adults, aged 18 and older, living in all 50 U.S. states and the District of Columbia. Americans' basic opinions of Barack Obama, John Boehner, Harry Reid, and Mitch McConnell have grown more negative since the government shutdown began. Nancy Pelosi's rating remains negative, but a little less negative than before. As the government shutdown continues, the GOP's favorable rating is now 28%, the lowest Gallup has measured for either party in its trend since 1992. The Democratic Party's favorability of 43% is down slightly from last month.